If you don’t already know the benefits of LED lighting, then read our article on why converting to LED is so beneficial for you and your business. When you decide to make this conversion, and we have little doubt you will, you may want some extra tips to help you when installing your new bulbs. Here are a few things you should consider. Some people think that changing to LED lighting will require the complete refiguration of their existing fittings. Others might believe all you need to do is screw in new bulbs. The truth is that it wholly depends on your existing system. Some very old buildings will need new fixtures because their current ones will not support the technology. However, these are becoming increasingly in the minority. Others may be able to keep their existing fixtures and retrofit the new LED light. They might do this by installing a ballast bypass, something much easier, cheaper and quicker than installing an entirely new fixture. Lastly, many fixtures will allow for direct replacement LED bulbs. These lights are plug and play, ideal when you want to save even more money. It would be quite frustrating if you spent money refitting your entire property only to discover you could have used direct replacements. Ensure you know what you need before purchase. When converting to LED lighting, you will find that the light quality is much better than other lighting technologies such as metal halide, high sodium pressure or other types of high intensity discharge bulbs. It can also be used with lens filters in the bulb to brighten up large spaces even with the highest of ceilings. The light quality is much better and they will stay brighter for longer, as they do not suffer lumen depreciation like HIDs. This means you may not need to fit as many lights as you have done previously. Also, by choosing some particular kinds of bulb, you may find that the diverse range of LED lamps might provide a better solution to your lighting problems. One of the great benefits of LED lighting is its programmability. You can make presets for lighting which will save you time, but that’s not all. You can also save on energy and resources by having the light match the time of day, location or even have special programs for particular industrial processes. 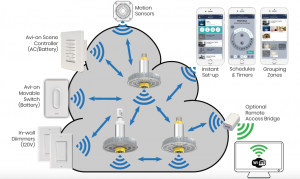 Motion sensors can also save you money by only having lighting on when needed. This also benefits security by illuminating little used dark areas without having to find switches. While LED lighting is the right technology for you, it doesn’t mean it’s all the same. Shamelessly we are going to tell you to buy from us at OEO, but that’s not just because we make LED. It’s also because we have incredible products at competitive prices, 5 year warranty on most bulbs and fixtures and a proven track record of customer loyalty which you can read from our testimonials. You should also ensure you technicians know what they are doing and have the right assessor. All of these tips will help your conversion go smoothly and ensure you get the most out of your new lighting system.